Got it running! On a crappy Lithonia shoplight of all things! 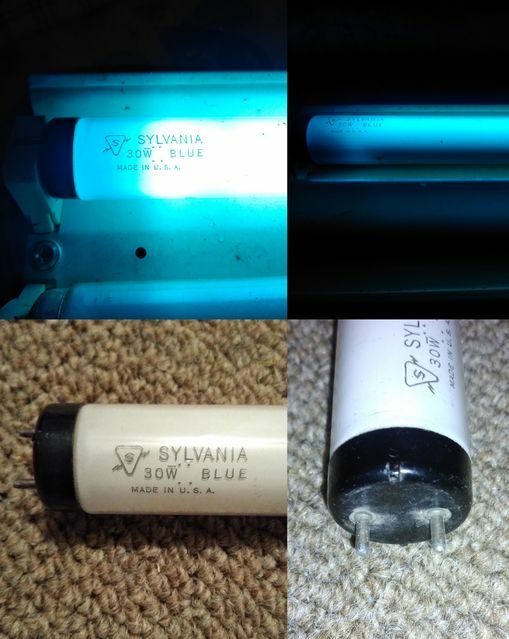 Lmao here you see the Sylvania blue blackender NOS in action!! The second Pic up top is more true to its real world color. Not the best to run it in one of those, but, whatever. Nice though! I also noticed a 1980's General Electric F96T12/CW 75w in service in service at my local ReStore. I might ask if I could swap it. It was donated to them and put in service half a year ago. I only lit it up for a few minutes.... I don't trust the shop light at all for lighting the tube permanently, but I wanted to see the thing lighted.... I used the same shoplight to light that light green tube I have.. It does the job I need it to do..
And cool I hope you get it!! Very nice! There are often cases of junk stores using donated lamps for their own fixtures.